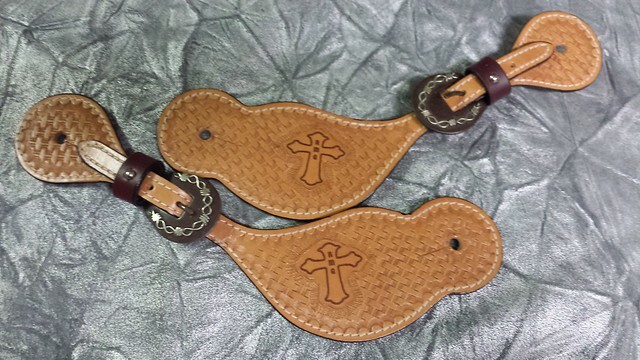 Hair on spur straps, plain spur straps, we can make just about any spur strap pattern that you'd like. Spur strap sets are available for all in the family; men, ladies and children. 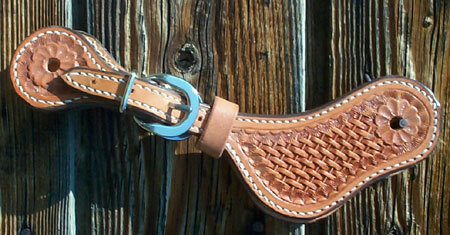 They are available in a variety of styles: new rosette spur straps, normal spur strap and the buckaroo style. 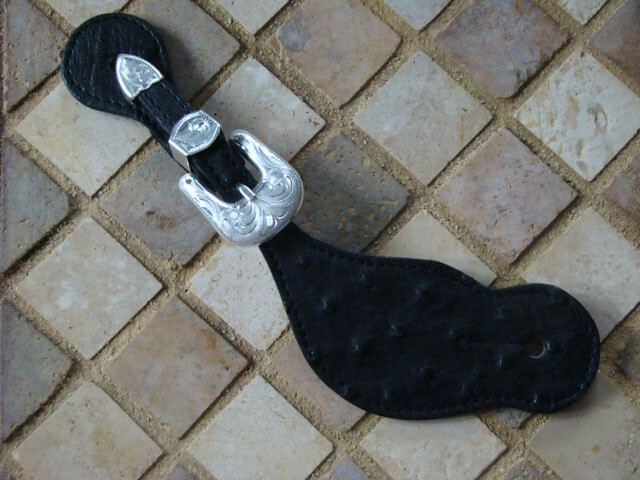 Our new spur strap is the rosette spur strap with a 1 1/2" concho. 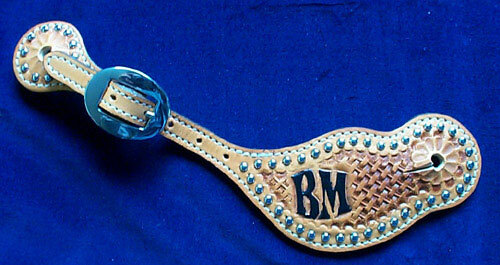 It is a very classy spur strap; concho and buckles can match or choose stainless or brass buckles. Our normal spur straps are available in silver, stainless and brass buckles, its available in hair on cowhide, russet leather and harness leather. 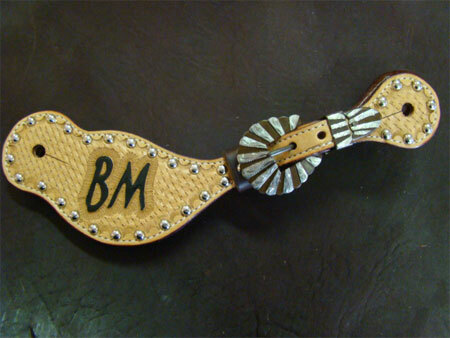 The buckaroo spur strap is a wider spur strap and it is available in silver, stainless and brass buckles. 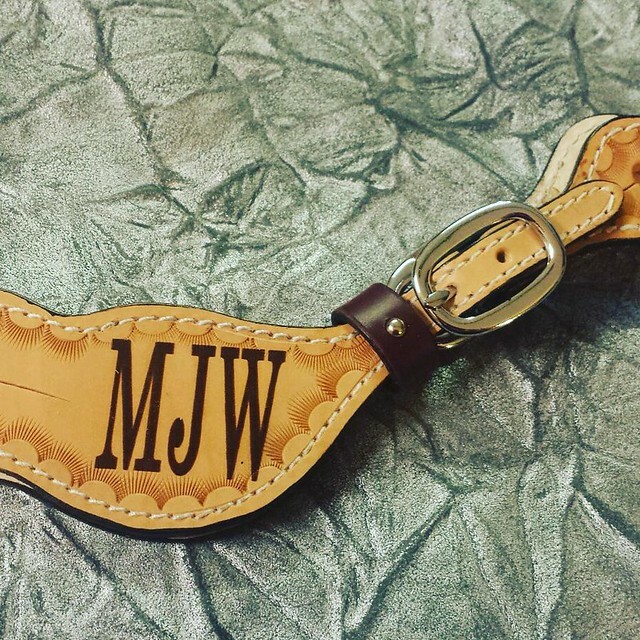 The buckaroo spur strap is available in hair on cowhide, russet leather and harness leather. The spur straps are all lined with a durable liner and are stitched grooved for the stitch to lay flat with the leather. Sets can be hand tooled in flower or basket stamped, available in white stitching or brown stitching. 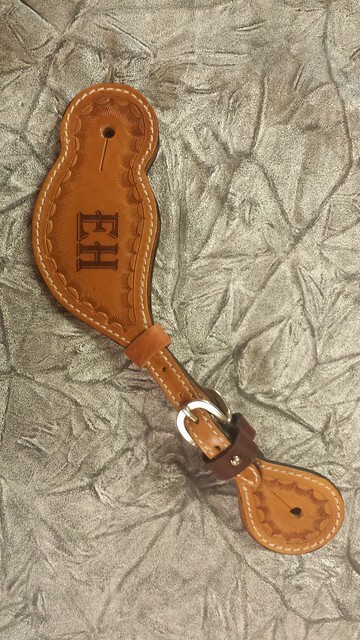 They can be personalized with your initials, brands and or your company logo (great for sponsors). All tooled products are oiled and then protected with a special solution which is hand rubbed over the finished product. Spots can be added for a nice decorative touch. 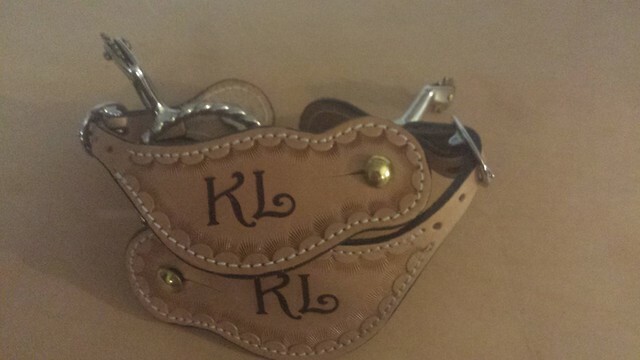 They are available in interchangeable silver buckle sets, stainless hardware or brass hardware. Pro-Champion Horse Gear trophy spur straps work great when your award requirements require multiples of one award be given out (eg. fast times in each go round). They are very affordable, and are different than most common awards. We usually use an embossing plate to apply the wording on these items as the area is on the smaller side. Built with either stainless steel or solid brass hardware, however silver buckle sets can also be added if you like.